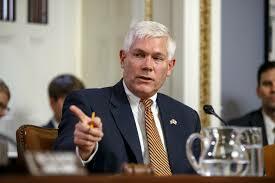 A video of one of the most powerful Republican Congressmen, Pete Sessions, shows Sessions saying that injustice in the family courts has lead to deadly results, and that father’s are entitled to equal time, but that our culture has stood in the way. Sessions admits that unfair judge rulings can lead to violence, and that some parents make unfair requests of the court, and that getting in front of the court can take too long, as he details a particular case where a prominent father in Highland Park Texas shot and killed his wife several years back. A Journalist with an online news website, Cameron Joseph (TPM), uses this video as a way to make it look like Sessions is supporting domestic violence and a killer. The video interview was done by what Cameron calls “a social conservative activist” who was pushing Sessions to adopt his views to end no-fault divorce. Rep. Pete Sessions (R-TX), the chairman of the influential House Rules Committee, told the activist that the way the family court system in Dallas used to process cases had led to some tragic consequences” but that the process was better now. Sessions stated that a man had killed his wife, the judge was unavailable, that the wife was making unfair requests, and that unfortunately it took death before changes were made. Pete’s, Chief of Staff, Caroline Boone, responded that “Pete was discussing a terrible situation where an individual felt he had been railroaded by a court and then committed a horrific act of violence. . .” but that he was not supporting domestic violence. The activist who made this video told TPM reporter that he was asked to take the video down, and that he had clipped certain things out of the video and posted an edited version of the interview. Sessions was describing that he recognized that he knows that there are problems in the court system and that he knows that people are frustrated and that this frustration can lead to very bad consequences. Some of the violent events related to family courts in the last several years is one where a man shot the Dallas Police Department building, and another where a well known Highland Park man shot and killed his wife, supposedly out of frustration, according to Sessions. Besides the wife being unfair, Sessions believes it was because the judge was out and unavailable to resolve the dispute immediately. Sessions claims that we now have a better system for parents in conflict over child custody than we had before because of the unfortunate recent deadly events. He says that now there are magistrates that are available all of the time, unlike judges. The activist argues that this is not always the case. Sessions also responds that he believes federal funding, Title IV-D, is causing problems. Not all Congress members believe this. In fact, years ago Ronald Palmer wrote to Senator John Cornyn complaining about the unconstitutional practices, and the letter that Ron got back was that this was not a federal issue, but rather a state issue. Perhaps Cornyn will be changing his position on this as pressure builds and more parents are taking their fight to Washington D.C. to put an end to Title IV-D. Sessions admits that the federal funding from Title IV-D is a problem. What is not discussed is that child support orders are being issued without proper due process. Sessions didn’t indicate that he understands that these courts are violating civil rights and issuing orders without applying required constitutional protections. If Sessions understood this, he would not have expected justice. The video doesn’t really go into detail on that, the activist recording the interview interrupts to push Sessions on agreeing with his view on no-fault divorce. Sessions stated that he would need to “bone up” on the issue since he didn’t expect those questions. We can help with that. It’s simple, burdening divorce leads to more false allegations, more violence, and deadly problems. History tells us that desperate spouses killed or were killed in marriages that they were unable to get out of. Good reputations were being ruined because you had to defame the other person to qualify for a divorce. Ronald Reagan signed the first no-fault divorce law in 1969 in California. The rest of the states followed after that with the last one, New York passing no-fault in 2010. History tells us that burdening divorce leads to deadly results. Spouses were killing to get out of a marriage. Some were being killed by an abusive spouse and some were killing the other spouse because they couldn’t prove enough abuse or they would commit perjury to prove the person was an adulterer or mentally abusive. It was so difficult to prove that the person took desperate measures. Why would we want to go back to that? Actually we can show you where we still have fault divorce. Some states still have some forms of fault divorce. 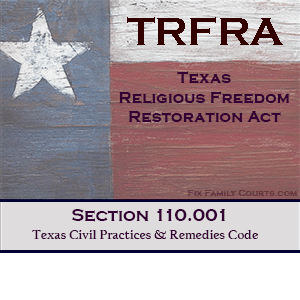 Texas and many other states still have an option to divorce under a fault cause. But even states that don’t, have best interest of the child. This may not prevent the divorce but it will show anyone contemplating whether or not they wish to support repealing no-fault divorce. Want to see what no-fault divorce would look like today? Anyone with children knows that there is no such thing as no fault divorce if you have children. One attorney states that burdening divorce led to more people committing perjury, and that “no-fault divorce allows the children to maintain good relationships with both parents and not grow up thinking that one parent has bad character.” But that the best interest of the child policy nullifies this as it places the parents in an adversarial system requiring them to defame each other, just like no-fault divorce requires. The same perjurious results that we saw prior to no-fault divorce passing in the 70’s is alive and well today and is happening in child custody suits. All of this discussion is actually academic because SCOTUS has said multiple times that people have a First Amendment right to free association which includes the right to divorce, or in other words to dissolve the marital association. The state is not allowed to burden that dissolution. This means that any attempt to go back to fault based divorce would result in federal courts overturning the law as unconstitutional. But even more than that, adding burdens leads to very damaging effects in the family court system. While we sympathize with Morgan’s intent, restoring fault-divorce would just take us back to the same deadly and bad results as before, and any fault legislation constitutionally is dead on arrival. Social conservatives want to return to these barbaric times because they want to police morality. This is an attempt to continue the tyranny through the family courts. When you give the courts control over relationships and bonds between two people, you are allowing the states to use bias, personal opinion, and prejudice and to apply that to you and your private decisions. This goes completely against your rights and how you exercise those rights. Government does not have a right to require you to stay bonded to someone. If the family courts followed the constitution you would not have these problems. Parents would not have the fear that they were going to lose their child to a family court tyrant or to a parent using the court to steal their child from them. There wouldn’t be the need to trump up false allegations, to commit perjury, or to use defamation of character because the Fourteenth Amendment protects you from this unjustified abuse of power. When the court protects rights children are protected from their parents needing to fight, children are protected from the court involving them, and children are protected from losing a parent. There would be no need for the judge to abuse the parents, to violate due process, and unjustly label anyone as a deadbeat parent. There would be no need to steal homes, steal money under the guise of child support, or create additional stress through an invasive court process. The push to repeal no-fault divorce is another attempt to put the government in control over your life, which we already know harms children and allows them to extort parents. If you are a parent and have gone through child custody you already live under that terror, you have experienced the harm that this has done to your life and your children. So the next time Sessions or anyone is asked to support taking away your right to no-fault divorce, just call any parent who has experienced best interest of the child policies, and you will know that it is a lie to tell you that putting government back in control over your marriage and your marital decisions is good for anyone. You can see through the rose-colored glasses they want to paint for you. No-Fault Divorce proponents will use scare tactics to try and get you to agree with them, and prey on your emotional upset at your loss of your marriage. If you are not the one who filed for divorce and felt like you were dragged through kicking and screaming, it might be easier for someone to make you think that no-fault could have solved your problems. No-fault is not the cause of your loss of your home, your rights to your children, and child support, best interest of the child phrase is. The constitution already protects you from these losses, the family courts ignore the constitution so that they can take over your life and micro-manage your private decisions, and take control of your money. Some religious proponents complain that divorce has bent morality, eroded the institution of marriage, and harms children. Divorce itself has not done this, the unconstitutional divorce process has done this. Cameron further reports that “One of Morgan’s arguments was his claim that 26 of the last 28 school shooters came from single-parent homes,” and “. . . that in his eyes has led to the breakdown of the family unit.” No-Fault divorce however does not require that a parent is stripped out of the child’s life. The family courts are choosing to do this on their own unconstitutionally. And Morgan misses that if a couple is divorcing, something already broke it down. That’s like saying divorce has caused divorce. It makes about as much sense as this chopped up video does. Judges already punish parents and their children for divorce and Morgan is asking for the court to make it even harder. While he is complaining about government he is asking for more government. Cameron’s article claims that some say no fault divorce has led to fewer false allegations to get divorced. If unburdening divorce has led to reduced lying then let’s unburden child custody. “After mentioning his support of law-and-order Republicans like Sen. John Cornyn (R-TX), who in earlier campaigns as Texas attorney general crusaded against “deadbeat dads” who didn’t pay child support, Sessions said that law didn’t always work.” If Sessions had Ron there, Ron could have explained to Sessions that if the judges were actually following the law of the land, then rulings would be just and it would be working. The misconception that most people have, and Sessions is no exception, is that the judges are following the law. The law doesn’t start and stop with state statutes. 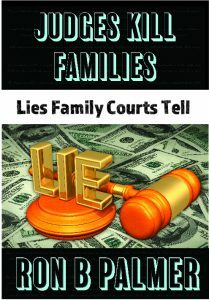 As Ron points out in his newest book, “Judges Kill Families: Lies Family Courts Tell,” judges have been perpetuating a false narrative that has created a fake idea that the courts are constitutional. Ron points to a quote from a Texas 4th appellate court ruling where they state that the constitution does not limit them in any way shape or form, and that they are immune from the supreme law of the land.” This is a lie, and Ron proves it in this brand new book! (This is a summary of the quote and not the actual words. You can read Ron’s book online here.) Get the book here and you can prove the Fourteenth Amendment protects you and your child. Simple, Easy Steps for Fighting False Allegations!